Tweet I had a great time at the Carnival of Madness tour featuring Shinedown, Chevelle, Puddle of Mudd, Sevendust and 10 Years. I’ve been a huge Sevendust fan for over a decade now. When I got the chance to interview a member of Sevendust for the second time (see first interview here: "Clint Lowery returns to Sevendust." - Interview) I jumped at the opportunity. This time around I got to chat with bassist Vinny Hornsby, also known as the Mayor of the Carnival of Madness. Zoiks - How are you doing? Vinny - I’m doing good man. Z - How’s the tour so far? V - The tour’s been great. Z - The tour features a lot of variety between the five bands. What does Sevendust bring to the Carnival of Madness? V - It’s a little different for all the bands, but we bring…we bring the party (laughs). No, it’s been real good. We’re friends with all of these guys. We’ve known these guys forever. As soon as this thing came up I was like, Ok, sounds like a good thing to do. It has actually turned out to be one of the most fun tours I’ve been on in a long time. Everybody is real close, we party together. Everybody is hanging out with everybody. The drama is very little. You’re going to have some drama, but it’s all good. Z - Have you gotten a chance to check out the other bands? V - All of them. Z - Who has stood out to you? V - I like everybody. The 10 Years guys are great friends of mine. I love those guys, they’re a great band. Shinedown is one of my favorite bands; they’re close friends of mine. Everybody out here is bringing something to the table. Z - I was talking with Brian from 10 Years and he was telling me that there is a dice game that breaks out behind Morgan’s drum kit during your set? V - (Laughs) There sure is. It breaks out in the middle of our set. They’re throwing craps back there, playing C-low. That’s the kind of stuff that’s been going on this tour. It’s a lot of fun, it’s summer time, it’s the life man. "Sevendust – 'Cold Day Memory.' The return of Clint Lowery. "), which marked the return of Clint Lowery to the lineup. What was it like working with Clint again? V - It was great. Clint came back to the band after he took his hiatus. We actually recorded the album here in Chicago with Johnny K. We got up here and spent a couple of months up here. It’s really my favorite album we’ve done since “Animosity.” We enjoyed doing it and it’s been pretty good. We’re blessed to be here. Z - Any of the songs going to make it into tonight’s set? V - Oh yeah, we’re going to play two or three off the new record. Z - Which songs translate best live? V - I like “Splinter” because it has the heavier edge on it. We’re going to play “Ride Insane” tonight because someone requested it. We’ve been switching them in and out. There’s only so much time we get in a set. Z - How long do you guys get to play? V - About 45 minutes, so seven or eight songs. Z - What keeps you guys going in this inconsistent music industry? I have to imagine it gets very frustrating. V - It’s frustrating at times, but we’ve been here a long time and we’re still viable in the situation. It gets frustrating sometimes. We’ve been through management situations, a couple lawsuits. That right there is the worst part of it. We’re finally clear of all of that right now; knock on wood (laughs as he knocks on his head). Who knows how long that’s going to last. But you know it’s what we like to do. Z - With all the down time on these festival tours what do you do to pass the time? V - In between playing we golf, go to nice restaurants, or shoot dice. Z - Are there any other artists that you’re really into right now? V - I’m into all kinds of stuff, country. 10 Years has a new album coming out, I’m looking forward to that. You know, it’s all good. I like Slipknot, Deftones. Deftones’ new stuff is great. I love all them guys. Disturbed, they’re friends of ours. Z - Do you get a chance to get out and see other shows? V - When we’re doing this there ain’t no shows going down. That’s the bad thing. The good thing is there are a lot of bands on this that we don’t get to see most of the year. Unless somebody happens to be playing real close at a club nearby we don’t have the time to get out. Z - What advice would you have for a band or artist trying to make it in the current music climate? V - You know what man, try to write the best songs, try to work with as many people as you can when you write the songs. Play as many gigs as you can play. On the business side of it be very careful. The industry has changed completely. All those major label want to sign those 360 deals. Z - When you were making “Cold Day Memory,” was there any level of stress or anxiety about the success of the album, or is it more like whatever happens, happens, we made the best album we could? V - That’s all we wanted to do. We spent a lot of time on it. To ourselves, when we were all writing the music we were all stoked about it. Like you said, when it comes out whatever happens, we’re putting it in other peoples’ hands. You have to trust other people. You can’t really stress over that. Seriously go and pick up “Cold Day Memory.” It’s as good as anything Sevendust has done. 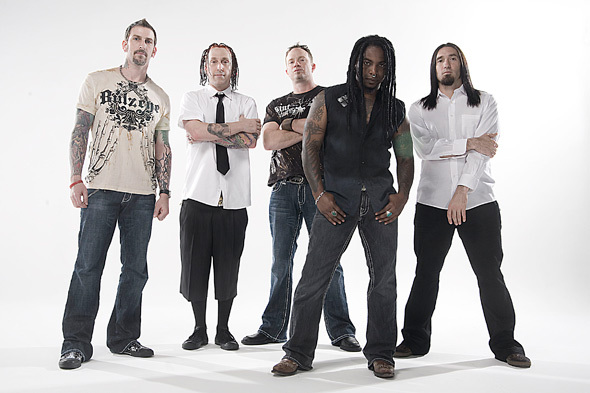 Also visit Sevendust at www.sevendust.com and follow them on twitter at http://twitter.com/sevendust. If you get a chance, check out Sevendust on tour with 10 Years on the Hard Drive Live tour.